Growing competition for land and natural resources saw a record number of environmental activists killed in 2016, says Global Witness. The green group's report details at least 200 murders across 24 countries, up significantly from 2015. Disputes over mining were the cause of the greatest number of killings, followed by logging and agribusiness. Brazil saw the most deaths overall, but there were big increases in Colombia and India. Global Witness has been publishing annual reports on the threats to activists since 2012, although it has data going back to 2002. The organisation compiles its analysis from media sources, information from other non-governmental organisations and from the UN. It also verifies the data with monitoring groups in priority countries, such as Brazil, Colombia, Honduras and the Philippines. Some 60% of the killings last year took place in Latin America, with a significant number of victims from indigenous communities. According to those who compiled the report, those doing the killing have become bolder in recent years. "We've always thought of these cases taking place in remote isolated areas but we are seeing attacks becoming more brazen, and that's because so few of these cases result in successful prosecutions," said Billy Kyte from Global Witness. "Indigenous people are massively over represented in the figures and that's because many of their lands overlap with lands rich in minerals and timber and also because they have less access to justice or communications." Disputes about mining resulted in 33 murders, while those linked to logging increased from 15 to 23 in a year. A similar number were linked to agribusiness projects. While Brazil saw the greatest number of killings with 49, Colombia saw a record high of 37. Although a peace deal has been agreed between the government and Farc rebels after 52 years of conflict, the hangover from the violence is still impacting environmental activists. "What we believe is that communities are going back to try and reclaim their lands in the context of the peace process and in doing so are coming into conflict with paramilitaries, with organised crime and with those who have stolen their land during the internal violence," said Billy Kyte. "There's also a power vacuum in some of these areas especially where the Farc had a lot of presence and that vacuum is being filled by organised crime and actors who want the land to grow monocultures like palm oil." India also recorded a growth in environmental violence with a three-fold increase in deaths. The report's authors believe that this was sparked by a general crackdown on activism. Almost half of those killed died in public protests or demonstrations. 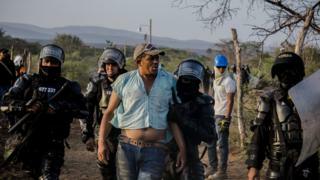 One of the most infamous murders of a green activist in 2016 was that of Berta Caceres, a Honduran campaigner who was shot after receiving dozens of death threats. However, Global Witness believes that her death has had some positive impacts. "Although Honduras had 14 killings last year, this year only one person has been killed," said Billy Kyte. "We did a lot of advocacy with the Honduran government and there has been huge international pressure after the killing of Berta. There are signs that some of that pressure is beginning to bear fruit but there are still many people being attacked." The authors believe that banks and investors in big mining, agribusiness or logging projects should do more to ensure that killings are not being carried out in their name. "Although they can seem one step removed from the violence, ultimately it's the investors money that is being invested in these projects that are causing this violence," said Billy Kyte. "In the case of Berta Caceres, she received 33 public death threats before she was killed and not once did the investors speak out to try and ease the tensions around the dam project they were investing in."